It’s Monday again and time for another set of mini missions. How did you go with the missions from Saturday and Monday last week? I know that Calico ginger, Susan S and Janetta were having some great success with their attempts to follow all seven and Mrs Green from Myzerowaste.com was also getting in on the act, Lady In a Small Town is even blogging about it and quite a number of you wrote in to say how much you liked the mini missions and are giving them your best shot. Did you do all seven or were there some things you didn’t have to do on the list because you have already taken care of some of these areas thoroughly already? Either way I hope your homes are a little less cluttered than they were at the start of last week. Monday – Get to the stores today and return anything you have lying around the house that you have been meaning to take back. Tuesday – Everyone has a drawer that holds stay pens. Go to it now and test to see which pens aren’t working and discard them. Wednesday – Go to where you store your manuals and warranties. Eliminate those that are now unnecessary or out of date. If you feel a little more adventurous get on-line and download any pdf’s available for your manuals and you will be able to free up a little more space in your filing cabinet. Thursday – If you have daughters with hair accessories now is a good time to declutter and re-organise these items. Friday – Have a look in your display cabinet there is bond to be something lingering in there that you long ago lost interest in. Time to send it to the thrift shop. Sunday – I think it is time we looked at the garage there must be at least two things you can quickly remove from there. Another one of Liam’s declutter items. Running into old friends and having a nice long chat. Knowing the air-conditioner is there if I need it – I think it is going to be a hot day. The nice espresso my husband just made me. Being safe and dry while many towns in Qld Australia are underwater in the worst floods in years. I’m in the USA, so not sure how to vote on the webblog awards-for nominee do I put my name then your url, or the name of your blog then your url? you did a champion job of the mini missions from last week, well done! How did it feel to get all those little annoying tasks out of the way? Good I bet. I also bet it didn’t take very long either. 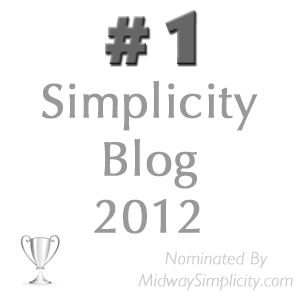 As for voting on the weblog awards – to me the procedure is as clear as mud but in the section you are talking about you need to put 365 Less things as the name (My blog is the nominee) and http://www.365lessthings.com. Sometimes blog names aren’t the same as the URL that us why you need to put both. Thank you for taking the time to consider voting it is very nice of you. Wow! I have already completed the mini missions for this week. I did them along with last weeks mini missions. I got so enthused about decluttering that I spent the week just having a fling — pun intended. It was great. Almost done with the entire house as far as a major mission and will then be able to start doing the deeper stuff–all of which has to do with gently suggesting to Mom we no longer need a lot of the stuff she is hanging onto. cute little pun thrown in there Deb. You are getting ahead of me which is great. Now I am going to have to come up with something tricky that you might have missed. I like a challenge so look out! I fact I think you have given me an idea. Last night I got inspired to organize my digital clutter i.e. computer hard drive, external hard drive, USB memory sticks and cd roms. I deleted dozens of files and folders and was able to fit all text files and photos into the external hard drive and get rid of the pile of cd’s. I was surprised by how little time it actually took to go through them all and organize the folders neatly. The amount of bad photos (shaken, blurred, red eyes) was amazing. Why on earth have I not bothered to delete them when I have downloaded the photos?!? I guess for the same reason I have not deleted mails from my inbox… That’ll be my next project! Wow! You have had a big week of c. I am glad you managed to tackle those letters and greeting cards. I have actually got a post written for tomorrow about decluttering/keeping greeting cards and letters. Since you haven’t finished the job yet it still may be of interest to you and help you in your next round of decluttering these particular items. Yahoo! Whoo! Go Anne! Excellent job of digital decluttering!!! Digital decluttering is quite a challenge! I’ve been doing that – wait til you hit the emails, I have decluttered 225000 – yes really – emails from 3 computers and a trillion flash sticks and external hard drives. Seeing as I only ever received about 50000 emails in 14 years (including all the spam! ), it was backups of backups, and so on. Earlier this year, I decluttered about 10000 PDF files which were duplicates. My next trick is the hundreds of photos I’ve accumulated over the last few years! (I did scan in all my hardcopy photos about 2 years ago). my husband sent our colour slides off to be scanned professionally last year and now he has just sent away a batch of 1000 photo negatives which will cost $500 to get scanned. The scan quality is far superior to what we can do here with our equipment and the hours involved puts us off doing it ourselves. Wow! Well done. I imagine you will be staying on top of the digital clutter in future after that mammoth effort. My husband is planning on doing a photo clean up soon too. I wish I could say we only had hundreds of photos but we have hundreds just of our last vacation and have been digital since 1990 something so it scares me to think how many photos he is going to have to plough through. Not sure if my previous comment made it through – so if you are seeing this twice, I apologize! Just wanted to let you know that I have successfully completed the first week of my resolution to start decluttering (thanks to your website) and managed to get rid of 44 items and it feels good! I even managed to complete most of the mini missions, although happily I had previously done some of the tasks, so felt like I was being rewarded with a night off on that day’s mission. I posted my resolved to get rid of at least 365 things this year on my FB page and cannot believe the positive response I got from my family and friends..they all think it’s a fabulous idea! Thanks for keeping us all motivated by posting daily on your blog, it definitely helps! your comment only came through once so the first one must have just went walk-about. (Bit of an Aussie expression that one) Good on you for having had such a good first week of decluttering and also for completing all the mini missions. How does it feel to be on your way to a more spacious home? Good I bet. I am glad my blog has been a help in your mission. At this rate you will be through the first 365 and on to the next before the end of February. It was a good idea the mention it on your facebook page and that your family and friends saw it and are encouraging you. Maybe they will automatically understand to be thoughtful about not buying you gifts that will reclutter if not you can always facebook that too. Keep up the good work and I look forward to hearing more about your progress. I post what I’ve decluttered every day on my FB page, which is a small group, just 50 friends and relatives. I’m up to day 224 now. Sometimes I get responses and often times I don’t, but three people have recently posted that, inspired by me, they’re doing some decluttering. I love it! good for you being a role model for your family and friends and the readers love you here as well. Keep it up. I am so glad you mentioned the garage because I went back to see what the mission was and noticed that I hadn’t finished writing what the mission was. It is fixed now thanks to you. A husband story from the Bogard household. We live where it is mostly warm, so my husband only owns a few sweaters, one of which he wore today. I suggested that we give his sweater shelf a quick go-through, and he muttered, “Didn’t we do that a couple years ago?” He was completely delighted when we discovered that his missing favorite (and not unacceptable) sweatshirt was lost there among his rarely worn sweaters. He was so inspired, we quickly went through the rest of the shelves: a pair of shoe trees, an ugly sweater, a heavy wool sweater, and a scarf and hat set to the thrift store, 5 pots of dried up shoe polish into the trash, and a couple of items moved to their rightful places. Plus we dusted all the shelves while the stuff was off them. Yeah! Wahoo! As for the refrigerator mini-mission: thanks for suggesting that I could take everything off the fridge and see how I liked it. Even though I think it looks tacky all cluttered up, I’m just so darned used to seeing it that way. You know, my life might grind to a halt if I didn’t see that 8 year old picture of Clara from some kid’s birthday party that I never really liked anyway……..
Oh how could I forget? He also parted with a too small sweatshirt from his HIGH SCHOOL days (he graduated in 1986). I NEVER thought I’d see the backside of that thing. It went into the rag pile. Even he could see that it was too sad for the thrift store. Yeah for you Cindy and for hubby who is finally seeing the error of his ways. your story of your husband decluttering was a lot like Liam and I last week. Good for you! It is amazing how quickly they can be converted when they see the benefits and results of what a half and hour or so can bring. So did you put the stuff back on the refrigerator or did you leave it bare. Sometimes a little reshuffle can make all the difference even if you put most of it back. I am a bare fridge kinda gal but each to his own I say. It’s only clutter if you think it is I say. I got only one thing done – using up dregs of laundry detergent in 3 old bottles (#1); however, I take heart from knowing I might not have even gotten that one thing done if it weren’t for the focusing properties of the mini-missions. I will switch two of the remaining tasks to week 2, though, as two of this week’s tasks are already done or don’t apply to me 🙂 This is such a great way to chip away at the mountain – and it’s nice to think that we have company (fellow unclutterers) while we’re doing it! I will let you off last week but don’t let it happen again young lady. 😉 I am expecting more from you this week. Just kidding. It is funny because I right this list and then never really look at it again. You’d think I would be doing my own mini missions but quite often I come up with them while I am doing the task myself so I am already ahead of myself. Wow, what a great response to the mini missions! I am going to print out each week’s and put it my organiser so I can check each day what I supposed to be doing and check them off. My weekend’s freecycling went great.I even got a bit creative with it – the community gardener who wanted my soldering iron and my wild flower recipe book also got a packet of solder, some brass hose fittings and a packet of dustmasks, as I figured they would be useful in the garden and the lady who wanted my curtain making book got a spare new reel of white cotton. No complaints so far! Calico Ginger, You’re a genius! well done mate, you are really getting into it. I have a little freecycling to do myself after Liam’s decluttering last week. Isn’t it nice to know that your things have moved to a new home where someone else can appreciate them anew. Freecycle is particularly good for things that don’t seem like the sort of stuff that you could send to the thrift store. I have a bunch of baseball cards and figurines that Liam no longer wants but I really don’t think the thrift store would want them because this isn’t America and baseball isn’t popular here. I have got rid of some before on freecycle and I imagine this lot will go easily enough. Congratulations on your efforts and I look forward to hearing how you go with this weeks mini missions. I love your mini-missions Colleen. They show me how far I’ve come in the last year or two. – Was going to return some duplicate Star Wars Lego my son got for Christmas, but he decided he can’t have enough Clones so we kept it. – Did the pen thing last week! – Did the warranties and manuals yesterday (in fact, did my whole ‘filing cabinet’ which is just ONE cube of my Ikea Expedit unit. Husband keeps all his work-related stuff in a separate cabinet). – As for the hair accessories, my daughter loses them at an astonishing rate. I actually have to BUY some! – Got rid of the display cabinet last year. – Deliberately bought a fridge that had the brushed stainless steel, so cannot hold magnets! – Don’t have a garage, but gave son’s old bike to friends over the weekend. No need to clarify I knew it was you, you mini mission and pre-thinking champion. That was a good idea to buy a stainless steel fridge so you don’t have to resist the temptation to put magnets on it. I will remember that if my fridge ever dies although it has served me well off and on for 23 years and shows no sign if giving up on me yet. I sounds like you had a lot of these mini missions under control because of forward thinking and that is even better than having to do them. So double good for you! Ok now I have spent about a half an hour trying to figure out how to put an image of a gold star on this reply without success but I want you to know I tried. I wanted to tell you I did your mini-missions last week and really enjoyed them. I’ve been slowly decluttering for a little over a year and your missions gave me new ideas of places to look for clutter. After awhile, the clutter isn’t as obvious as I pare down my things more and more. I plan to do this week’s too, possibly all of them today because I’m snowed in and can’t get to work. I think these mini-missions were a great idea! first of all I’d like to say welcome to 365lessthings and thank you for dropping in with a comment. I hope you will drop by more often as the bigger our collective wisdom the more we can learn. I am curious as to when you discovered my blog and how you found it. I have been getting a lot of new readers lately but have no idea what has brought them to me. Please let me know how and when you came upon my blog. I am glad you have been participating in the mini missions and finding things to declutter that you didn’t even know were there. Quite often the stuff that is a little obscure and not at all obvious is the clutter that gets away with being undetected for some time. I am going to have to come up with trickier missions as time wears on so we can find the really interesting stuff. Since you asked, I saw a link to your blog on one of the minimalist blogs I read. I’m sorry I can’t remember which one because it was probably a month or so ago that I first came here. thank you for letting me know and for staying and reading each day. Wow, I thought I was going to be ahead of everyone this week, and look what is being done! AND got rid of some things in the display cabinets about the same time. See what effect you have on us, Colleen? My refrigerator door is pristine (I hide everything on the side away from the room, he, he.) I did get rid of a couple of slips from that bunch also. I’ll deal with the hair accessories (mine) and I cringe to have to go back and see what Colleen added about the garage. Eeeeek. We don’t have one of those, but there is a storage shed so large we call it Big Bertha. I will have to opt out on that one until the weather gets back above freezing, however. Have a great week, everyone and keep helping us out, Colleen. nice effort on your behalf and isn’t it great to be ahead of the game. I had to laugh at you hiding things down the side of the fridge away from the room, I do exactly the same thing. 😆 My hair accessories are dwindling down to very few by natural progression decluttering so I don’t need to deal with that one. It does sound to me though that there must be something out there in Big Bertha that you could find to part with once the weather improves. Talking about bad weather, the flood situation in Queensland Australia is insane at the moment. My daughter is on her way home from Brisbane City today to one of the outer suburbs and I hope she gets home OK. They are shutting down public transport soon because they are expected a floor surge to reach Brisbane from where it hit the NW Qld town of Toowoomba yesterday. Scary stuff. I hope things settle down soon but more rain is expected and towns already under water are expected to cop it again. I LOVE Mini Mission Monday! I just wrote about it on my blog because it has inspired me so much. I do have to say your 365 Less Things has been inspiring me for….ahem….a year!!!! I love your blog. And 2011 is starting out fabulously!!!! thank you for taking an interest in my blog. I went over to take a look at yours and got sidetracked for an hour not only looking at yours but checking out No Impact Man. I have really got to stop finding new blog there just aren’t enough hours in the day. ;). Drop by and leave a comment whenever you feel the need and keep up those mini missions.